Laravel 5 came out with a nice Auth scaffolding, which included all of the routes/controllers/views for registering and authenticating a user. Laravel 5 got away with this to keep the product slim (which I think is a good move). First, make sure you have a fresh install of Laravel. 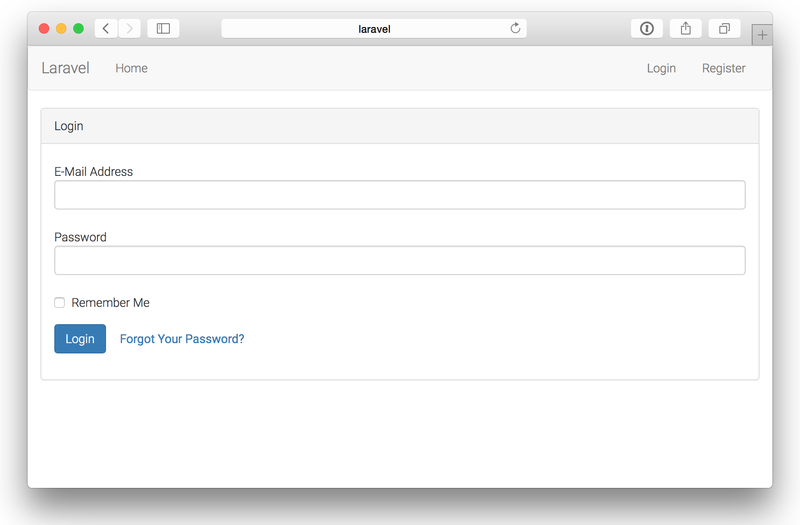 Here is my tutorial on Installing Laravel 5.1 on OSX with MAMP. After downloading bootstrap add the bootstrap.css file into the public/css directory. (you may have to create the css directory. Also copy over bootstrap’s fonts directory into your app’s public directory. Add the following routes to the app/Http/routes.php file. Create a new resources/views/auth directory. Within that directory, create the following files. For the “forgot password” email, create a resources/views/emails directory, and place the following file into it. To make it so that we can actually register a new user and login, we’ll have to create the proper database tables. Fortunately, this is already available through migrations. First, create a new database table, and define it’s connection in the .env file. Laravel 5.1 defaults to mailtrap.io. First time I gave this a try, and it’s actually quite easy! First step is to setup mailtrap.io account. Update from address in config/mail.php file. Note the use of use App\Http\Controllers\Controller;. This is important since were using a different namespace for our dashboard. Add to Auth/PasswordController.php and Auth/AuthController.php files.